Search for the best flight prices from Manchester to Lyon. Compare prices, book today and save money with Manchester Airport. France’s third city (and capital of the Rhone region) is also its internationally acclaimed capital of gastronomy, with more than its fair share of world class cuisine. Best discovered on foot, its historic centre is a perfectly preserved medieval city with a maze of alleyways hiding tiny boutiques and eateries. Elsewhere it’s an ultra-modern city – oozing 21st century French techno-charm, where everything actually works. 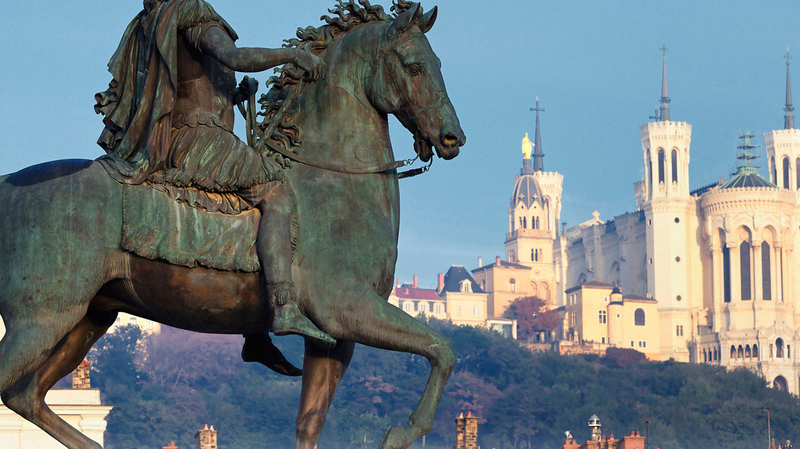 From exquisite boutique hotels nestled within the UNESCO-protected city centre to snazzy contemporary accommodation, Lyon has something for just about everyone. Foodies will appreciate the Michelin-starred restaurant at the gorgeous five-star Cour des Loges (6 rue du Boeuf), while history buffs should check into restored monastery Villa Florentine (25 montée Saint Barthélémy). If you’re after something a little quirky, the four-star Hôtel Le Collège (5 place Saint-Paul) has been designed to resemble a 1930s school complete with desks, blackboards and bookcases. Alternatively, secret gem Hôtel de la Marne (78 rue de la Charité) offers good quality, comfortable budget accommodation. Lyon is the retail capital of the Rhône-Alpes, with a good line in everything from kitsch craft stalls to classy boutiques. The city’s real forte, however, is its fabulous flea markets – Les Puces du Canal (1 rue du Canal) is the largest in the region and covers an incredible 5,000 square metres of warehouse space. You’ll also find more than 650 antiques shops in the downtown area, not to mention endless racks of vintage goodies at La Cité des Antiquaires (117 boulevard de Stalingrad) and Canal Flea Market (1 rue du Canal). The established designer stores tend to be clustered around Rue du Président Édouard Herriot, but for up-and-coming names head to the Creators’ Village on Passage Thiaffait. When it comes to Michelin-starred restaurants, only Paris can beat Lyon for number and variety. This is true gourmet heaven, and nowhere epitomises the classic elegance of the city’s foodie scene better than L'Auberge du Pont de Collonges (40 rue de la Plage). This three-Michelin-star restaurant just outside Lyon ranked 20th in the world in the Elite Traveler World's Top Restaurants Guide 2012, and eating here is a once-in-a-lifetime experience. If your budget won’t stretch quite this far, opt for an authentic local brasserie such as Brasserie Georges (30 cours de Verdun) or La Mère Jean (5 rue des Marronniers). The regional dishes served at Chez Mounier (3 rue des Marronniers) are also great value for money. More than 1,000 exhibitors come together to create this internationally famous product fair. It covers home environment, leisure, well-being and travel, and is a must for anybody with an interest in creative design. During the months of June and July, this high-energy arts festival takes over Lyon’s antique Roman Theatre with more than 50 multi-disciplinary performances. It features everything from films and music to dance and theatre shows. This populist festival is unusual in that it never shows new films. Instead, it celebrates the great actors, directors and writers of the past century, with a week of major shows, retrospectives and exhibitions. If you’re a fan of antique and vintage furniture then this fabulous celebration of all things retro is an essential addition to your calendar. Every year, on the first Thursday of October, a red carpet is rolled out in the heart of Lyon’s famous antiques district, and visitors are encouraged to browse over 600 shops and stalls to the accompaniment of live music. Dating back to 1643, this winter festival now attracts more than four million revellers. Light shows fill the sky, residents put candles in their windows and urban icons are decorated with stunning visual light displays.